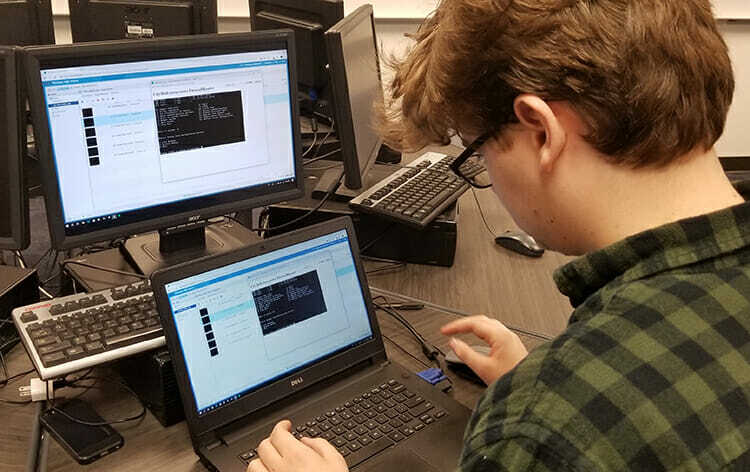 Michigan is cultivating a collection of amazing cybersecurity training facilities, called Cyber Range hubs, that are shining models for what’s possible when inspired program leaders are given access to leading-edge resources, wisely supplied by public agencies and private foundations. As a guest of the Michigan Economic Development Corporation, I recently had the chance to tour the Pinckney Community High School Cyber Training Institute in a rural community outside of Ann Arbor, and the newly opened Cyber Range hub at the West Michigan Center for Arts + Technology, or WMCAT, in Grand Rapids. These two facilities lacked nothing in terms of state-of-the-art telepresence equipment and training and testing curriculums. Both were well-equipped to teach, test and train individuals ranging from teen-agers and non-technical adults, to working system administrators and even seasoned tech security pros. State-of-the-art telepresence gear, supplied by Merit Network, funnels everything from capture-the-flag exercises to full course work and certification testing to earn 42 different professional designations. Related: Michigan establishes a roadmap for cybersecurity readiness. Merit Network, by the way, is quite unique. The Ann Arbor-based nonprofit began as a partnership among three state universities in 1966 and is one of the original building blocks of the Internet. Today Merit supplies IT infrastructure to schools, universities, government and other entities across the state. For a drill down on Merit, and its role supplying Cyber Range infrastructure, please listen to the accompanying podcast with Pierrette Dagg, Merit’s director of marketing and communications. What jumped out at me on my visit to Pinckney Township and Grand Rapids was not so much the tech gear and the curriculum, which in each case was top notch. I came away most impressed by the dedication and creativity of the program leaders, which clearly is making a big difference on a very human scale. Take, for example, 17-year-old Pinckney senior Aidan Ozias. I looked over Aidan’s shoulder as he typed away on a class project of his design. His task was to lead a team of students in improving the security posture of a fully mocked-up city network, called Alphaville, pumped into his high school lab courtesy of Merit. Across the hallway, a few of his classmates hacked away, remotely, at the controls of a drone, attempting to knock it out of the sky. Another cluster of students attempted to crack into an Alphaville industrial controls system. Guiding youth is vital, of course. However, beyond that, Jim Darga, Pinckney principal and director of its Cyber Range hub, and Mike Galea, a member of the business information systems faculty at nearby Washtenaw Community College, have teamed up to also extend the hub’s services to the local adult population. Galea speaks proudly about one of his community college students — a Sprint store manager in his 30s, who knew nothing about the inner workings of networks. The student thrived in Washtenaw’s cybersecurity track and landed a new career as a pen tester for a German auto supplier. “He’s now hacking cars for a living,” Galea says. Meanwhile, Pinckney’s Darga has taken the initiative to spearhead efforts to cater to military veterans and to disabled individuals, as well, particularly persons with autism. Veterans have an inclination to continually defend their country, and many have security clearances, he says. “We took a close look to see who has the talent and skill sets that lends itself to a cybersecurity career,” Darga says. And after studying autism support programs in Australia and Israel, Darga learned that people on the autism spectrum can have an innate sense for detecting patterns, and often function well in narrowly defined frameworks. A couple of hours drive west of Pinckney, in the lower left of the mitten, Grand Rapids is best known as the hometown of Pres. Gerald R. Ford and for its giant furniture manufacturing companies. WMCAT occupies a large commercial building on the edge of downtown Grand Rapids that provides community members, from all backgrounds, with an eclectic mix of programs to help them make economic and social progress in their lives. During workday hours, adults can drop in to take an art or sewing class or attend a lecture. As soon as school lets out, youngsters pour into the halls on their way to various afterschool extracurricular activities. In mid-October, Cyber Range hub training became the latest public service offered at WMCAT. The full slate of training, certification testing and product testing available at other Cyber Range hubs are now available in Grand Rapids. And as the hub ramps up its services, one of the tasks assigned to program manager Anthony Tuttle is to make cybersecurity more understandable and accessible to WMCAT’s constituency. Tuttle can lean on the enthusiastic support from the West Michigan Cyber Security Consortium, an association of 700 regional businesses that are very much clued into the importance of narrowing the cybersecurity talent gap. Healthcare company Spectrum Health is a consortium member, and its director of information security, Jim Kuiphof, serves as an advisor to Tuttle. Kuiphoff says he views the Cyber Range hub as an excellent venue to train future security technicians and have them learn on a trial-and-error basis, with nothing on the line. “The opportunity for individuals to experience failures and learn with their peers, in a non-critical setting, was a huge piece that was missing,” Kuiphof says. My guess is that Gov. Rick Snyder had no idea these dynamics would unfold when he boldly made cybersecurity readiness a top priority upon taking office in 2011. As he heads back into the private sector at the close of this year, Snyder can take pride in how Michigan has become a wellspring of fresh thinking about how to engrain cybersecurity awareness among the next generation of IT staffers and company decision makers. One of the mandates Tuttle, the energetic program director, has been tasked with makes this point well. Very well done, Michigan. Keep it going.